The United States declared war on Germany in April 1917. During the years of American Involvement in World War I, 114,224 men and women from Iowa served in the armed forces for the United States. Of the men drafted for service, 51.7 percent were farmers or farm laborers. Seventeen National Guard divisions were assigned to the AEF during World War I. One of the first National Guard divisions to reach France was the 42nd (Rainbow) Division. The 42nd Division was a composite division made up of soldiers from many states. It included Iowa’s 168th Infantry Regiment. Iowa has always answered the call to do their part in helping to preserve our freedom and the freedom of others, and the Great War was no exception. Northwest of Des Moines, a small National Guard encampment called Camp Dodge would play a key role in helping to train a rapidly expanding national army for the Great War. Camp Dodge was established in 1909 as a training site for the Iowa Militia. It was named for Major General Grenville M. Dodge of Council Bluffs, Iowa’s most famous Civil War commander. Originally constructed on a 78-acre tract of land, the post had been expanded to 570 acres by 1917. 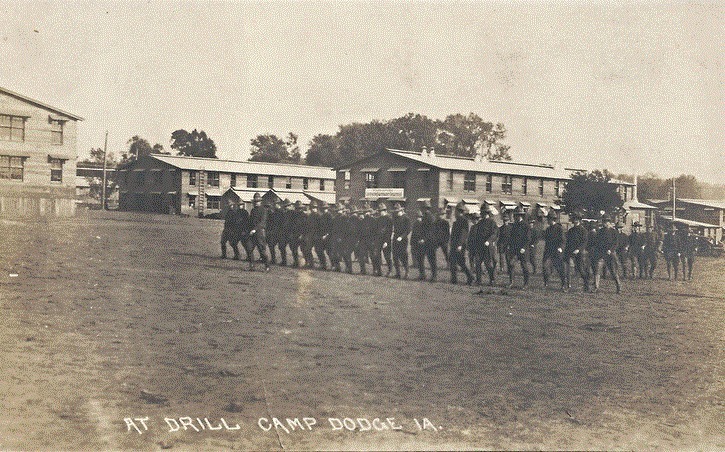 On June 15, 1917, a delegation from the U. S. Army Selection Board chose Camp Dodge as one of sixteen regional training camps for the National Army of the United States. Expanded, through lease options, to 6,400 acres, Camp Dodge provided initial military training to recruits (both volunteers and draftees) from Iowa, Nebraska, Minnesota, and North and South Dakota.